Justice Antonin Scalia, who during three decades on the Supreme Court strengthened conservative jurisprudence and revived a focus on the Constitution’s original meaning, was found dead at 79 on Saturday, February 12. Scalia spent his final hours in the Cibolo Creek Ranch Hotel in Shafter, Texas. Flags at the Supreme Court are lowered in honor of his death. The night before he died, there were no signs that anything was wrong. Sources said he had dinner at the exclusive West Texas ranch and excused himself at around 9 p.m. When he did not show up for an 8 a.m. excursion, John Poindexter, owner of the Cibolo Creek, started to get worried. “I had not seen him, and everyone else was up. I knocked loudly,” Poindexter told the Los Angeles Times. 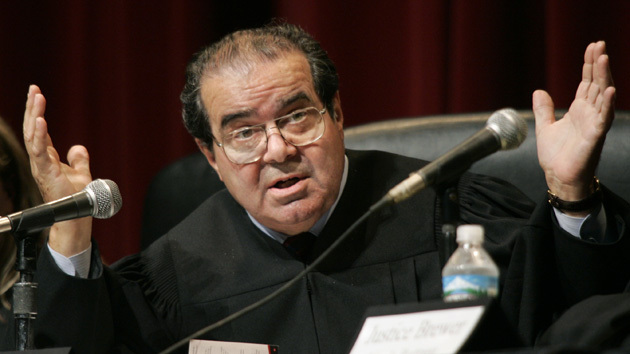 Poindexter called a hospital and an official apparently said it would be impossible to resuscitate Scalia. The U.S. Marshals Service was called and then that “set into motion hours of intense discussions about how to navigate the protocols associated with the death of a Supreme Court justice outside the Washington area.” Scalia died of natural causes. Scalia was appointed as a Supreme Court Justice at in 1986 by former President Ronald Reagan. Justice Scalia wrote landmark rulings and overturned expectations for pending rulings on gun rights, affirmative action, abortion, criminal law and free speech, and dissented, sometimes furiously, from landmark decisions expanding gay rights, reining in the death penalty and affirming abortion rights. In 2008, he wrote a landmark 5-4 ruling striking down Washington, D.C.’s ban on handguns in an opinion that for the first time said the Second Amendment confers gun ownership rights in the home. While tributes poured in from across the political spectrum, politicians in Washington immediately began thinking of Justice Scalia’s successor. “I plan to fulfill my constitutional duties to nominate a successor in due time,” Mr. Obama said, calling on the Senate to “fulfill its responsibility” to give his choice a fair hearing and vote. Senate Majority Leader Mitch McConnell, fearing that whomever Obama picks will tip the ideological balance of the nation’s highest court to the left, has already made it clear that he believes next president should be responsible for appointing a justice. He declares that the seat should be vacant until January saying, “The American people should have a voice in the selection of their next Supreme Court Justice. Therefore a vacancy should not be filled until we have a new president.” GOP presidential candidates, including Senator Ted Cruz and Senator Marco Rubio, have made similar statements. On the court, his loss breaks the narrow 5-4 conservative majority that has held for decades, one reinforced 10 years ago when the second of two George W. Bush appointees was confirmed. The prospects for dramatic conservative victories on a range of controversial issues immediately diminished, as a 4-4 split on the court would leave standing lower court rulings conservatives hoped to overturn.